Includes cutting and grinding wheels and stones, burrs, sanding drums, felt polishing felt tips and compound. For model and jewellery-making, arts and crafts, home decor, car care, woodworking, DIY and restoration. For use on ceramics, tiles, stone, glass, plastics, fibreglass, metals, alloys and wood. 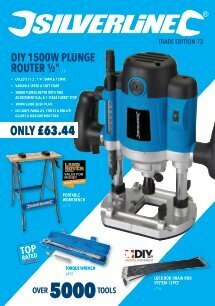 Compatible with most rotary tools including Silverline, GMC and Dremel. Mandrel 3.17mm. Max 28,000rpm. If there''s one Rotary Tool Accessory Kit to purchase after buying a Rotary Tool it''s this one. The 3.17mm Mandrel ensures compatibility across the board but, I highly recommend buying the 135W Multi-Function Rotary Tool from Silverline for any Craftsman, DIYer or Hobbyist. All parts of this kit are good quality and the range of usability you''ll get out of this set is endless. It''s a steal. This Silverline Rotary Tool Accessory Kit 105pce is guaranteed for a period of 30 days from date of purchase against a fault developing in either the materials or the workmanship during manufacture. You can register for your Lifetime guarantee by registering your product online. Any faulty goods will be repaired or replaced free of charge.